' Tara Donovan - Animator: Animating Igloo VFX commercials for "HHGreg"
Animating Igloo VFX commercials for "HHGreg"
I did a second HHGreg commercial for Igloo -- an ad for Serta Mattresses -- this time he's bouncing about in a not-too-complicated tracking shot. Please note the sheep were added later by someone else. 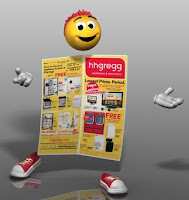 Just before the holidays, Toronto's Igloo VFX sent us a commercial a for American department store "HHGreg". Lively, upbeat acting was the mandate for a character who's quite literally a flyer. We were able to turn this around really quickly thanks to the friendly crew at Igloo, the artistic and technically-savvy Phil Bonner and our fellow animator-friend Jesse Barnett. Here's an edit of the commercial with just the bits I animated.